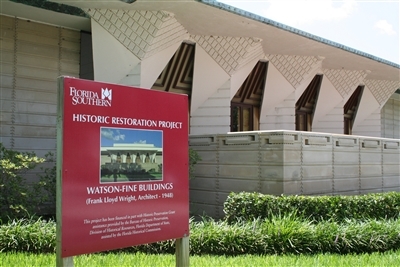 Known for its collection of buildings designed by Frank Lloyd Wright, Florida Southern College is adding a new one for the first time in at least 40 years. Photos by Susan Green. LAKELAND -- A new tourism and education center designed by the late Frank Lloyd Wright will add to the architectural exhibit that is Florida Southern College (FSC), helping the campus attract up to 90,000 visitors a year, college officials said. The historic institution with Methodist roots is home to the largest collection of Wright’s architecture in the world and already attracts thousands of visitors a year. The new Sharp Family Tourism and Education Center will funnel those visitors to a central point on the campus and promote the school’s unique architectural heritage. “I have been here 25 years and I don’t know how many times I have had to direct people who come to the campus just to see the Frank Lloyd Wright buildings,” said Terry Dennis, FSC’s vice president for finance and administration, who oversees campus construction. In addition to a new design being built, existing features designed by Frank Lloyd Wright, including the Water Dome, have been undergoing restoration at FSC. The center is slated to open this fall. Other buildings on the drawing board include new business and dance schools. The Tourism and Education Center is based on an original Wright design for housing that was never built. The “Usonian” homes were part of Wright’s master plan for the campus, including living quarters for the school’s faculty. But financing was never available for the small, flat-roof, two-bedroom homes, so the design gathered dust. The project is the first time in more than 40 years that an original Wright design is being built on the site where the architect designed it and for the intended client, Dennis said. The new center is expected to include an introductory film on Wright's career and his 20-year relationship with Florida Southern, plus a gift shop and tourism kiosk with information on other Polk County attractions. It will also be the starting point for docent-led, audio and self-guided tours. The center will be named in honor of FSC alumnus and former trustee Robert R. Sharp and his wife, Peggy, whose financial contribution made the project possible. Chipping in another $1.5 million were Polk County and the city of Lakeland. A 40-minute drive from Orlando and its 50 million annual tourists, the college is hoping to promote itself as the premier destination for fans of the American architectural icon. Above, a new FSC business building is in the works for the site of the former Florida UMC bishop's residence. Below, work continues on an original Frank Lloyd Wright design that will become a tourist information center at the college. “It’s up to us to promote it now, but I have a hard time thinking we would not be able to attract some of those tourists who are interested in architecture,” Dennis said. Mark Jackson, director of Polk County Tourism and Sports Marketing, said the new center will make for a more informative tourist experience. “It will provide much needed information about the architectural treasure we have in Lakeland. Will it attract more people? I can’t answer that,” Jackson said. Drawing 90,000 visitors a year is within the college’s grasp, Dennis said, based on talks with other Frank Lloyd Wright centers across the nation. Revenue from visitors will help offset the cost of maintaining the Wright buildings. Wright’s style, described as “organic architecture” designed with its environment in mind, will also be evident in FSC’s new Wynee Warden Dance Studio and Bill and Mary Ann Becker Business Building. 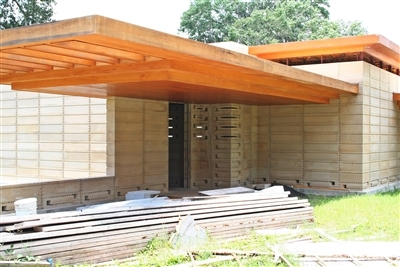 “We are always careful not to copy Wright, but the new buildings pick up on his forms and designs,” Dennis said. The 4,700-square-foot dance studio will feature a high glass half-rotunda that will allow natural light to illuminate the dance floor. The building also includes faculty offices and dressing rooms. The studio is named for Winifred “Wynee” Warden of Orlando, a philanthropist and benefactor of Florida Southern. The first toes will be tapping at the center next spring. 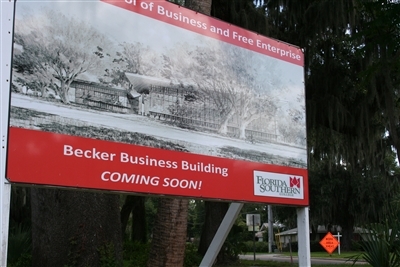 The three-story, 37,000-square-foot Becker Business Building will go up on the former site of the Florida Conference bishop's residence, next door to the FSC admissions office. It will house the Barney Barnett School of Business and Free Enterprise with state-of-the-art classrooms, as well as a specialized trading room to simulate the environment of a bank or investment company. The building is one of four designed by Robert A.M. Stern Architects. Wright’s hand will be evident in the new building through precast panels, stucco and decorative metalwork. And so began the long relationship between Florida Southern College (FSC) and architect Frank Lloyd Wright. Spivey, then FSC president, had a vision of constructing a modern campus in Central Florida. Wright was 70 when he first trekked to Lakeland. As he toured the orange grove overlooking Lake Hollingsworth, he envisioned the buildings rising “out of the ground, into the light, a child of the sun.” His master plan called for 18 structures, of which 12 were eventually built. The first groundbreaking quickly followed, on May 24, 1938. The first Wright-designed building, the Annie Pfeiffer Chapel, was completed and dedicated March 9, 1941. Students built the chapel, Seminar Buildings, and E.T. Roux Library in exchange for tuition discounts. Steel and manpower shortages during World War II slowed the construction. 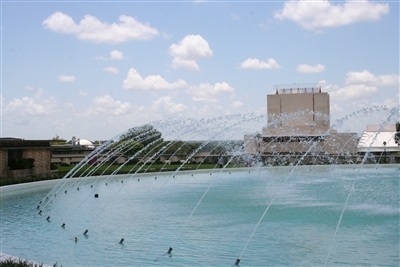 The existing "Child of the Sun" collection took 20 years to build, concluding with the Polk County Science Building in 1959, which was finished shortly after Wright’s death. The structures have been modified over the years. The Annie Pfeiffer Chapel was rebuilt under Wright’s supervision after an unnamed hurricane damaged the original in 1944. Later, interior walls, air conditioning and ventilation systems were added to Wright's buildings as necessity overruled his concepts. In 2007, The World Monuments Fund placed the collection of Wright buildings on its list of endangered sites. Restoration efforts have attempted not only to halt the damage inflicted by Florida’s climate but reclaim some of Wright’s original designs. The Water Dome, which did not work as Wright intended when it was built in 1948, was reconstructed under the supervision of architect Jeff Baker and inaugurated in 2008. That same year, the college received a $350,000 grant to begin restoration of the Annie Pfeiffer Chapel. The only theater-in-the-round that Wright designed, located in the Ordway Building, was restored to its original state in 2012. In 1975, the Child of the Sun collection was placed on the National Register of Historic Places by the National Park Service, and in 2012, it became a National Historic Landmark. 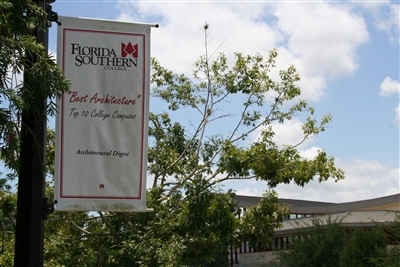 FSC was among the "Top Ten College Campuses with the Best Architecture" by Architectural Digest in August 2011 and named Most Beautiful Campus in the nation by The Princeton Review in 2012 and 2013.